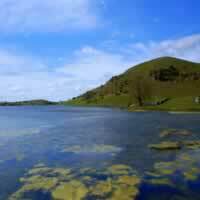 Lough Gur is one of Ireland`s archaeological and historical gems. The beautiful and enchanted lake lies 13 miles south east of Limerick city. From the level surrounding countryside it unfolds in beauty with its placid waters and rugged hills; a fairyland of stone circles, ancient habitation sites, megalith tombs, crannogs and castles. Lough Gur tells the story of the pre-Celtic settlers who first came to the area over 6,000 years and continues to the present day in the people who still dwell and farm in the locality. It is an archaeological site of outstanding significance. The lake is now crescent shaped but this is mainly due to drainage works carried on in the middle of the 19th century. The drainage works reduced the level of the water by about 10 feet and on the newly exposed lakeshore was found the many artifacts which directed archaeological interest to the area. Lough Gur is at the heart of a remarkable archaeological landscape featuring sites that represent every major period of human history in Ireland. Physical evidence of occupation from the Neolithic, Bronze Age, Iron Age, Early Christian, Medieval, Early Modern and Modern eras has been found in the immediate vicinity. 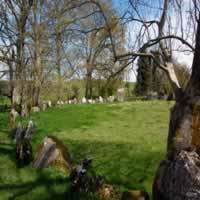 It is the largest standing stone circle in Ireland, 150 feet in diameter and enclosed by 113 standing stones. The largest stone is Rannach Chruim Duibh (Crom Dubh`s Division) and is over 13 feet high and weighs 40 tons. The stone circle is aligned with the rising sun at the Summer Solstice on the morning of which the sun shines down directly in the center of the circle. The entrance stones are matched by a pair of equally impressive slabs on the southwest side, whose tops slope down towards each other to form a v-shape. During excavations no structures were found but two hearths; a few un-burnt human bones, some animal bones (mainly cattle), some bronze materials and numerous Neolithic pottery pieces were discovered. A short distance to the north-north east of the main stone circle, is a second smaller circle, also constructed of large stones. To the north of this is a large leaning standing stone. Located 300 yards west of Lough Gur, it is situated beside the Limerick-Kilmallock road, 2.5 miles north of Bruff. A visitor center was built in 1980 and uses the design of two of the excavated stone age houses as its plan. It houses a number of displays covering stone age and bronze age implements, pottery and weaving. Display cases tell the story of the manufacture and use of flint and bronze material and their eventual deposition in the area as well as their recovery - whether as a result of scientific excavation or random finds. Visitors to the Heritage Center at Lough Gur can find out about the rich heritage of Lough Gur by visiting the interactive multimedia exhibition that brings to life over 6,000 years of archaeology and history. The exhibition is suitable for all ages and brings the visitor on a journey through the history of Lough Gur starting during the Mesolithic Era, and progressing until the 19th century. 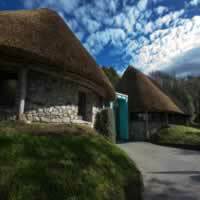 Heritage Center highlights include: A modern exhibition detailing over 6,000 years of history at Lough Gur, listening points, audio guides, archaeological dig, Neolithic Pot model, AV presentation and interactive touch screens. There are replicas of Stone Age pottery as well as other artifacts depicting the lifestyles of the first inhabitants of Lough Gur. Two further display cases house the following: The replica of the Bronze Age Lough Gur Shield exhibited at the `Treasures of an Island` exhibition in the Cognac Museum in 1997 and now on display in the National Museum in Dublin. The replicas of the Countess of Bath Chalice and Paten with which the church (situated on the lakeshore) was endowed shortly after its consecration for Anglican worship in the late 16th century. There are a total of 9 new information panels. Two of the panels are mounted on the side of the display cases and give information on archaeological research in Lough Gur. A further 6 panels give information on the following: Geology of the area, Lough Gur Botany, Zoology of the area, Archaeology of Lough Gur, Celtic Festivals, Lough Gur Folklore. There is also a retail area and coffee dock. A great folk tale deals with Gearoid Iarla, 3rd Earl of Desmond who was Chief Justice for Ireland in 1367 following the Statutes of Kilkenny. He lived from 1338 to 1398 and as well as dabbling in magic, he composed verse in both Irish and French. As a punishment for his involvement in magic, he did not die but lives beneath the waters of the lake. Every seven years he rides around the lake margin on his white horse, shod with silver shoes. When the shoes are finally worn, he will regain his mortal form and restore the glory of the Desmonds.